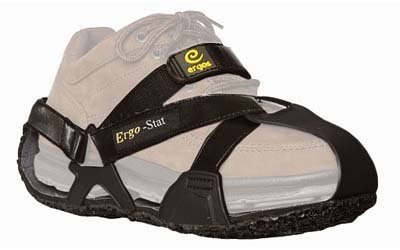 ASG-1000 ESD Comfort Grounder - The anti-fatigue matting you can wear! The ESD Comfort Sole Grounder uses the highest quality materials that deliver performance and durability. Fitted with a rugged 1 Mohm resistor with 18” conductive ribbon, the ESD Comfort Grounder provides stationary and mobile workers with safe static discharge to ground when the ribbon is tucked between the sock and shoe and a dissipative floor is used. ESD protection using the ESD Comfort Grounder on both feet provides consistent grounding through the entire walking motion. Like a mobile antifatigue mat, the ESD Comfort Grounder dramatically reduces pain and fatigue experienced when standing or walking on hard surfaces. ASG-1000 ESD Comfort Grounder straps onto almost any type of footwear, including safety shoes, and is fully adjustable, can be cleaned. Available in 5 sizes and two colors, black and clean room white. Anyone standing or walking for extended periods of time on hard, smooth ESD surfaces that require static control protection. Any area where anti-fatigue matting is impractical due to size or moving equipment. Anyone who wants to complement a well-designed ergonomic program and 20.20 ESD protection program. The ESD Comfort Grounders are suitable for: manufacturing, clean room, pharmaceutical, defense, munitions, medical, and quality control personnel. Lower cost than comfort ESD mats. Reduces wear on expensive ESD footwear. 100% coverage. All employees can now experience the benefits that only those standing on stationary comfort mats and ESD protection previously enjoyed. 100% efficiency. Stand or walk on all of the mat, all of the time. Increased productivity. Now all employees can experience static protection, increased comfort, energy and vitality resulting in greater safety, productivity and profitability. Increased slip resistance. Compared to both regular and slip resistant footwear. Increased life of footwear including safety shoes. Drains static electricity safely. Reduced trip hazards. No edges to trip on when walking on and off a mat. Reduced cleaning and maintenance costs. Think of all the time and effort spent cleaning and maintaining traditional mats. The ASG-1000 ESD Comfort Grounder shoes are also easily cleaned. Reduced waste material. Up to 90% less material sent to landfill when mat is replaced.